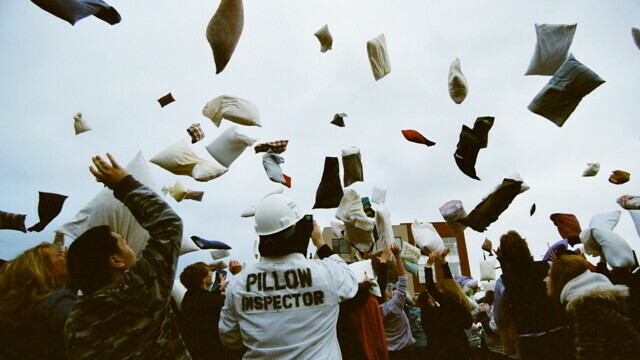 If this keeps up it will be 85 degrees and sunny for our annual April Fools’ Day Pillow Fight on Sunday, April 1. The first day of April is an iffy time to hold an outdoor event – even if it only lasts all of about 15 minutes. We’ve seen snow, rain, sun, and every possible mixture of the three, with temperatures ranging from the 30s to the 70s. This year, the feathery fury will be on a Sunday, which changes the dynamic a bit. Same location (corner of Madison and Forest Streets, across from the Farmers’ Market) but this year at a different time – now 3pm instead of the usual 6pm. That gives you plenty of time to make an announcement at church, have a big ol’ Sunday dinner, and get the whole congregation downtown for a pillow battle of biblical proportions. If you’ve never been to the Pillow Fight, and you’re just not sure if it’s right for you, we think if you mosey on over to VolumeOne.org/PillowFight, where you can see photos, watch a video, and learn more about this community tradition, you just might find out it’s not only right for you, but it’s right for you, your family, your friends, and yes, maybe even your entire congregation.